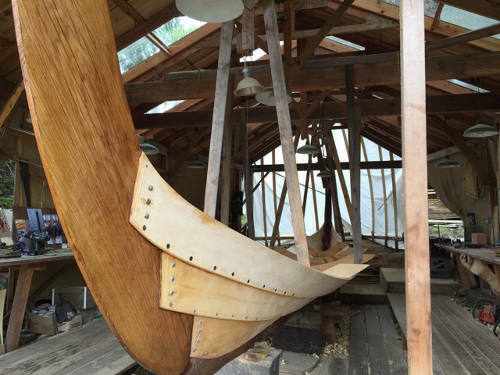 Class member Stuart Boyd has a fascinating project, building a viking ship. The full story is here but you can read about it below as well! Stuart Boyd can imagine what a sight a Viking boat would be from Crane Beach or sailing up the Essex River. The Hamilton resident can picture it because he’s having one built. “I can just imagine it at Crane Beach, the stares and the awe,” he said. The boat, which will be 38 feet long, will then become the centerpiece for his new business, Norsvald, which was borne of a “flippant comment” he made while striving to solve a problem in the tech world. Originally from Bangor, Co. Down, itself a sailing town in Northern Ireland, Boyd explained over coffee in Zumi’s how he went from working in consumer electronics to self-employment on a Viking boat. “I’ve always been on the water,” he said. An experienced sailor and licensed captain, Boyd said he wouldn’t consider himself an expert on wooden boats. Meanwhile, in his professional life, Boyd found himself working in tech companies and learning a lot about teams and putting together high-performing groups. Casting his eye to the world of startup businesses — and it’s sky-high failure rate — Boyd wondered if he could build teams across the fledgling businesses to help them improve their odds. While in Denmark “scouting around the tech scene there,” Boyd popped into a Viking museum to look around. Looking at the old ships, including one that had been built in 1040 in the Viking settlement of Dublin, Boyd was struck by how the Vikings worked together on the sea in open boats to travel great distances. “I’d rather see a Viking ship sail up the back of Crane Beach and take small groups on that,” he said in the museum. The Norvalds seed had been planted. “The technology is so old, yet it’s relevant today,” he said. All it needed now was an authentic Viking ship. Built from scratch. On the North Shore — that the U.S. Coast Guard would approve for commercial use. 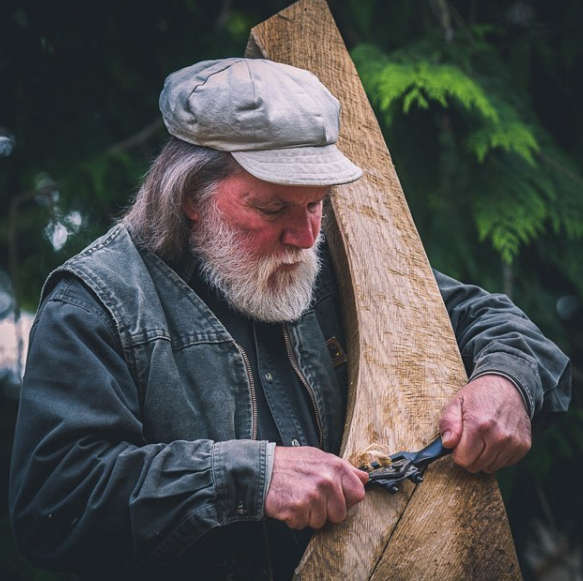 Through his research, Boyd found Jay Smith, owner of Aspoya Boatyards in Anacortes, Wash.
A Midwesterner, Smith went to Norway as a young man and studied boat building in the Nordic tradition there. He has been in the business for 30 years now. However, the vessel being built isn’t for a private owner. It will take 12 paying customers and two crew on team-building exercises. That requires permits and safety checks. Boyd is liaising with the Coast Guard to ensure that happens. 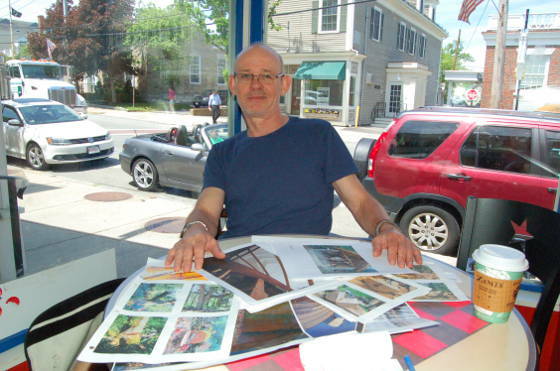 He is working with Jim Taylor, who has his own yacht design company in Marblehead, to ensure the Coast Guard recognizes and approves the boat as seaworthy. But Viking building techniques and materials are also being included, Boyd said. Over 1,000 hand-made rivets are being used, for example. Made from old logging chains, the rivets had to be chemically analyzed and tested for strength in a lab to be approved as building materials. But details like that will be important for people to experience living history while on the team-building exercises, Boyd thinks. The hull, built from oak carefully selected from forests of the Pacific Northwest, is almost half built, Boyd reported. With the help of an arborist, trees were chosen where their natural crooks formed the boat’s shape. Four “strakes” are already in place, and three more need to be added, Boyd said. The Washington work should wind up later this year. The hull will then be loaded on a truck and driven across the country. It’s an easy enough ride, Boyd laughed. “It’s literally one left turn” off Route 5 in Washington, then it’s I-90 all the way east. The vessel will then be completed — and launched from — the Burnham Boatyard in Essex. 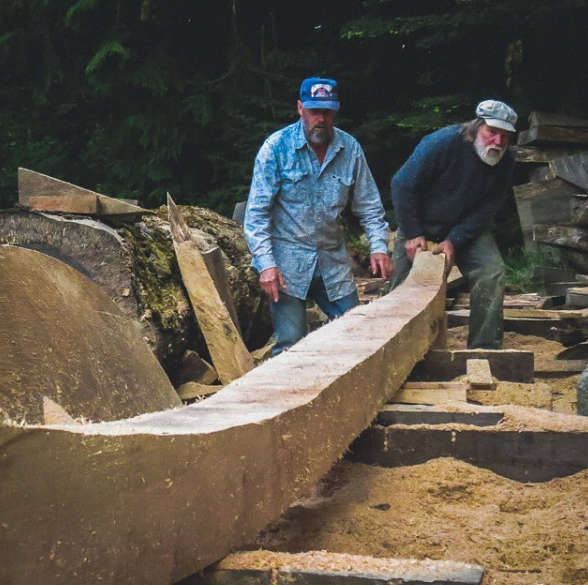 That business, itself, is famous because Harold Burnham is an 11th-generation boatbuilder. Boyd is not worried the bi-coastal experts will clash. “Boat builders warm to each other,” he said. When complete, the craft will be around 10 feet tall from top to bottom. Viking ships had very shallow drafts, and just under two feet will be under water. Referring to the experiential and outdoor-education business, Boyd describes Norsvald as “Outward Bound for busy people.” Right now, his intention is to sail from Gloucester, and groups will sail for a day or half-day, he said. Another element will deal with education, where technical, mathematical, or scientific concepts are shown in practice. “We’re taking the concepts taught in school and applying them in a non-classroom environment,” Boyd said. Four people are working on the project, including Boyd, who is full-time on it. But his goal is to build a business, educate people and form teams. “I want the folks in Denmark to be proud of this,” he said.